π On October 4, 2006, Akira Haraguchi, a 60 year old Japanese mental health counselor who lives near Tokyo, recited pi to 100,000 decimal places from memory. It took him fourteen and a half hours. 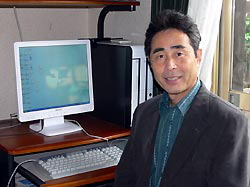 Haraguchi is seeking to be listed in the Guinness Book of Records which at the time, listed Hiroyuki Goto also of Japan, as the record holder having recited 42,195 pi decimal places from memory in February of 1995. Click on the photo to read more about how he did it.